I wanted to find my art. I spent years watching friends find hobbies, art, passion, and wondered where mine was. Put me in a crowd of programmers, or engineers, and I'm the artistic one, but put me in a group of artists and I'm the nerd with a day job. After the fact, it made perfect sense that my art -- because I'm choosing to give myself that word -- would fall somewhere along the spectrum of logic. 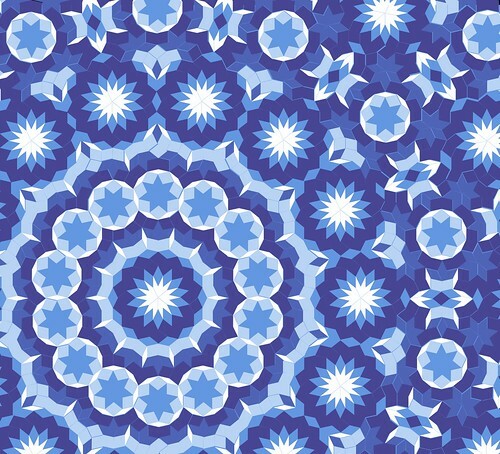 I next focused on finishing the center mandala. My coworkers remember this part well; I worked on it during lectures during our company on-site. I stopped photographing it then, because it was getting harder and harder to pin the (enormous) top to my design board. Even with the width unfinished, it was bigger than my design board, and I am short enough that taking it down and putting it back up became more and more of a chore. Eagle eyes will spot I was already photographing it with a 90-degree rotation, because that was the side I'd finished first. Frequently I have to remind myself that my photos show it rotated 90 degrees off from my plan, because I've not seen it right side up in many months. My goal became RIGHT SIDE UP. 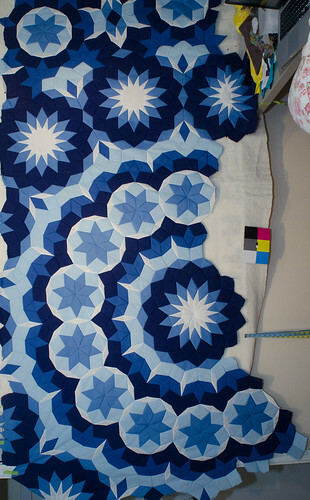 The only way to do it was to stop my slow gradual progress across the quilt, and focus on the top edge. Build it out enough that I could attach a temporary sleeve to it, so I could use my beloved photographic backdrop stands to hoist Seven Brides and photograph it right side up. This goal has become my miniature obsession within the overall obsession that is Seven Brides: even if it isn't done, get it done enough so I can see it right side up when I photograph progress. As it turns out, the progress photographs matter. They are my proof that my nights sitting here quietly, absorbing podcasts and television while I sew, are not wasted but are in fact progress. In a project this size, you cannot see progress on a day-by-day basis. 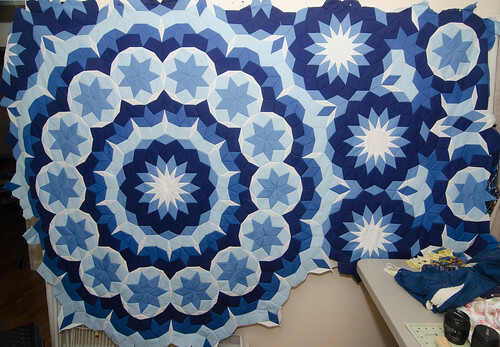 You need weeks before changes become apparent when a single three-layered, seven-pointed star (light blue interior, lighter blue surrounding layer, encased in white) takes an entire evening to complete. I've accepted that this quilt is an obsession. I've tackled virtually no new projects while working on it, because it isn't willing to share me. I've tried toying with other ideas, but there just isn't room, not when there is the siren song of "you could finish another figure tonight if you buckle down and start right after dinner." It's forced some changes in how I sew -- I am now deeply opinionated about thimbles, and have gone back to contact lenses in no small part because I can stack on powerful non-prescription reading glasses to magnify my work. My thumb tendons tell me I am not infinite. I rest them frequently now, and am more protective of my hands at work because I know if I do not protect them, there are no other hands that will complete this project. Sometimes my mind drifts back to the Hackleburg tornado, and how my closet thoughts that day included regret I had not tackled this project. That's the woman I've promised this quilt completion to, and who I think about when I debate whether or not I will submit it for judging. 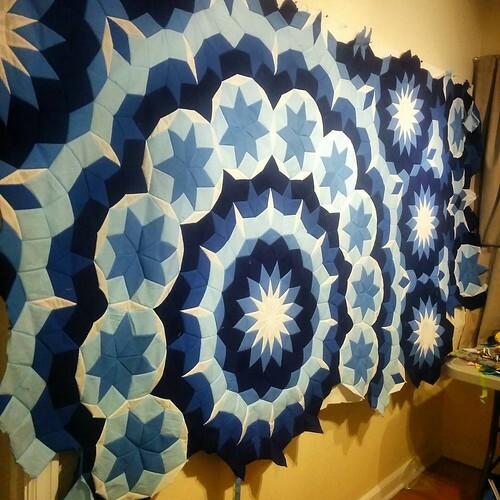 I've shown it to a couple of quilters, and their opinion is that Seven Brides should be entered into a national show; this prospect is terrifying, but also satisfying. The prospect of letting others see (and judge) my obsession is nerve-wracking, but also emboldening. It's the first quilt of mine that I think can withstand such scrutiny. In the meantime, I'm on my couch this weekend, trying to hit my goal of completing the top edge all the way out to the right corner. Completing the edge lets me attach a hanging sleeve, which lets me photograph progress, which will do nothing but encourage me. It looks like a woman sitting on a couch with headphones on, rocking out to Spotify playlists, patiently making one piece at a time. It looks peaceful. It looks quiet, but make no mistake, it's still obsession.